Orvis is an outdoor gear company that makes everything ranging from cloths to sporting goods to hunting gear. When it comes to knives, they make a wide variety of traditional folding knives that are ideal for hunting, fishing, camping, and other general outdoor use. They also make fixed blade knives and multitools, as well as personalized knives. 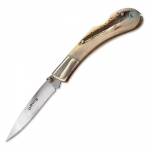 Below is a chart showing the best Orvis knives on the site as reviewed by multiple users. Keep in mind that there are many great Orvis knives out there, but if you can't decide on one after searching the site, choose one off this list and we are confident that you will be happy!